Clear braces or aligners can be a wonderful alternative to metal braces. They are removable and do not require wires or brackets! Clear braces are an easy and discreet solution to align and straighten your teeth using a series of custom made, removable aligners. Each aligner moves your teeth just a little bit at a time until the desired result is achieved. Whether your teeth are crowded or spaced, crooked or turned, clear braces can straighten and align teeth to achieve the smile you have always wanted. Are you a candidate for clear aligners? We will first evaluate your teeth to make sure that you are a candidate for clear braces. Some patients may achieve a greater benefit with traditional braces. Once you decide to begin treatment, we will take an impression of your teeth which is then used to make several sets of custom clear aligners for you. You will need periodic follow-up appointments so that we can check your progress and give you your next set of aligners. How long will my clear aligner treatment take? Every patient has different needs and therefore treatment lengths vary. Small adjustments to one or two teeth can usually be accomplished in about 6 months. 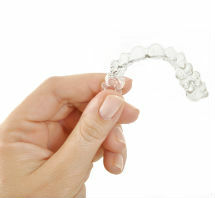 Once you have completed your clear aligner treatment, we will give you a retainer, which you will wear to bed every night. It is very important that you wear your retainer every night. Teeth are not static. They are dynamic, always moving, and they will continue to move and shift if you don’t wear your retainer. Think of your retainer becoming a lifelong friend, and good friends are meant for life! When do I wear my clear aligners? Clear aligners are a “lifestyle”, meaning you need to wear them 24/7 to achieve the best possible result. We will instruct you to only remove them to eat or drink. You can drink cold water with your aligners, but hot or colored beverages will compromise the integrity of your clear braces. Please ask us how clear aligners can help you get a stunning, healthy smile.